You know it’s the end of the breeding season when everyone starts molting. Remember ALGE? He and OLLA had three nestlings, who fledged a while ago. We recaptured ALGE by chance and found that he was in the middle of his fall molt. This is the biggest molt of the year for juncos (they also have a small one in the spring, generally involving just some head and body feathers). 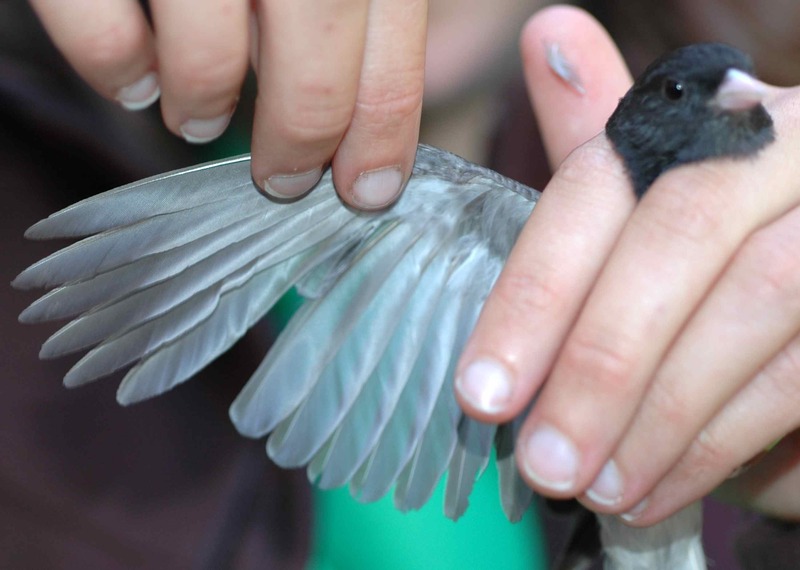 The outer wing feathers to the left of ALGE’s short feathers are the secondaries; the feathers to the right are the primaries. 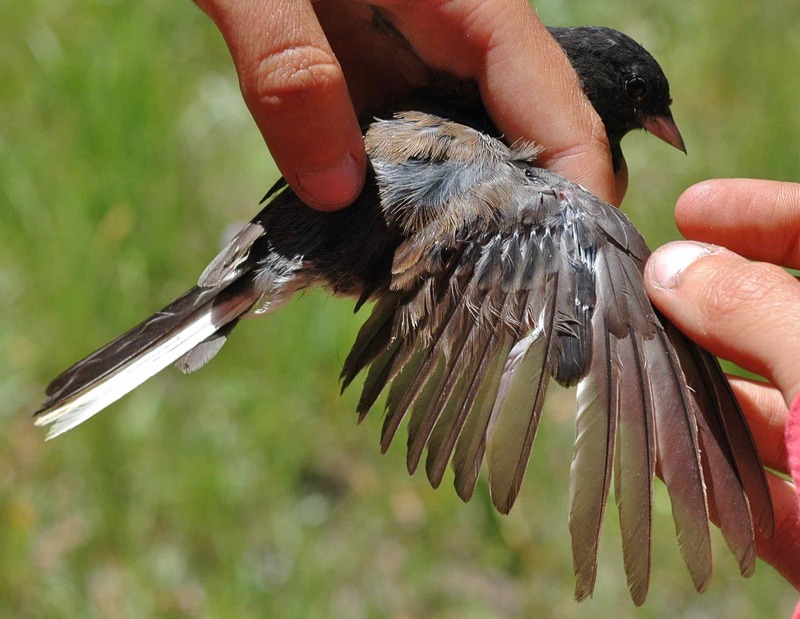 Like most other songbirds, juncos molt their wings beginning at the meeting point of the primaries and the secondaries, i.e. right where ALGE has short new feathers growing in. The molt then proceeds both in towards the body (secondaries) and out to the wing tip (primaries). Sometimes the secondaries don’t start molting until the primaries are partway along. At the base of the secondaries you can see that ALGE is growing in new secondary coverts as well. You can tell that they are new because they still have some of the white feather sheath around them. 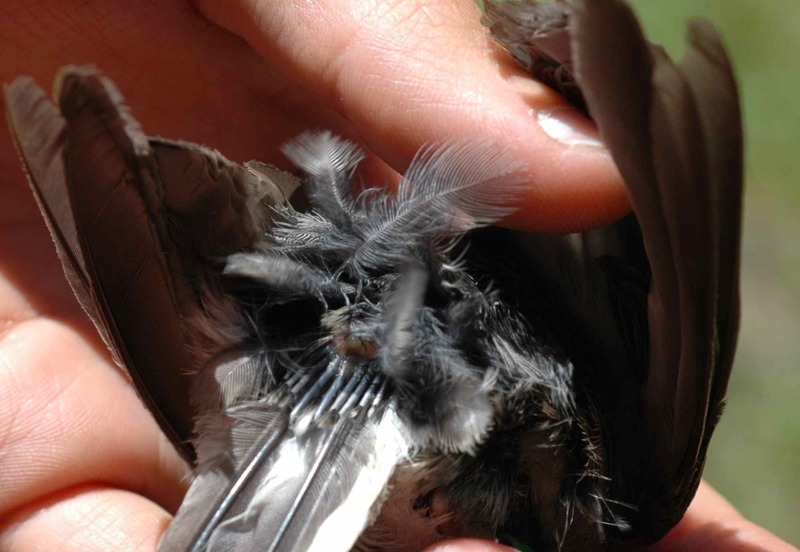 Molting is extremely important for birds because feathers are not indestructible. They get degraded by mites, by the sun, by blowing sand. 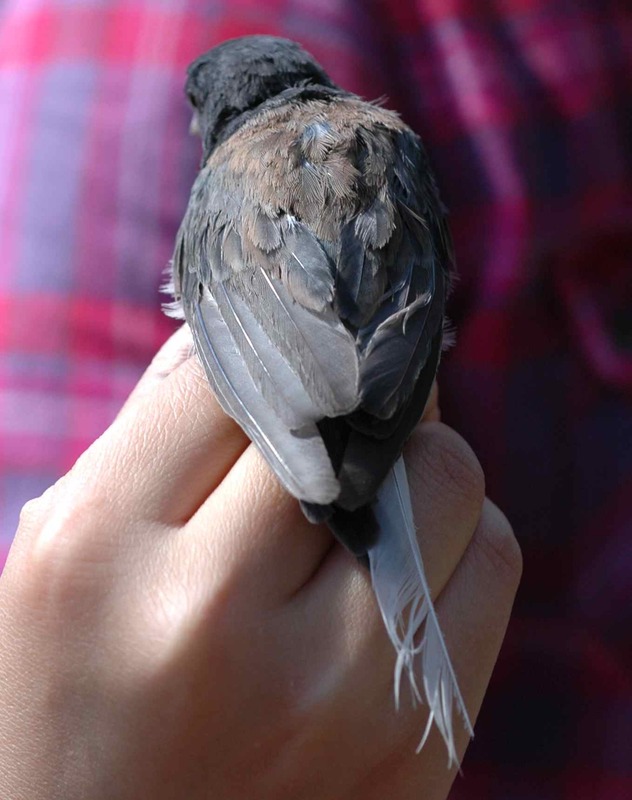 Sometimes the ends break off entirely: a lot of the juncos we caught had a tail feather with the end broken off. Ratty or broken feathers don’t work nearly as well for flying, so the birds have to spend more energy to fly. Songbirds usually have a big molt in the fall because many of them migrate in the fall, and it’s a good idea to be the most efficient flyer you can be if you need to make it across a continent or two. Molting takes a lot of energy. The most energetically expensive parts of a bird’s year are thought to be migration (if the species migrates), breeding (all those eggs to produce and chicks to feed), and molting. 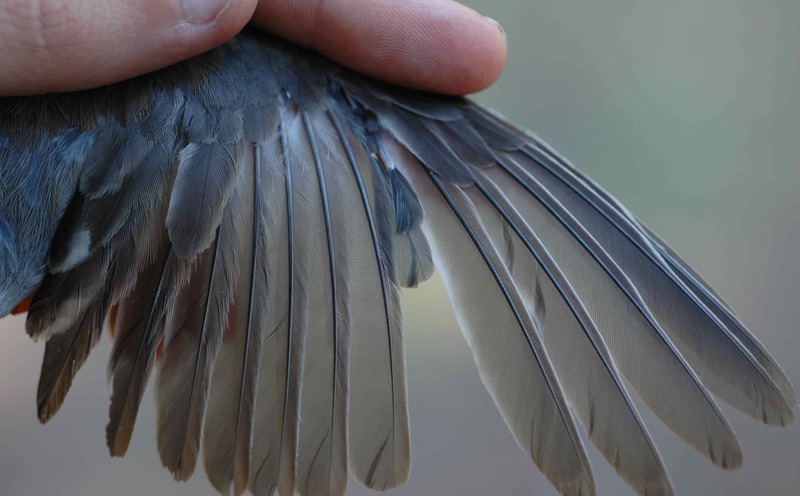 Birds have a lot of feathers, and growing all of them takes a lot of resources. Imagine growing six-inch-long, thick hair all over your body in a week: you’d look like a lhasa apso dog, yes, but you’d also probably need to eat a lot more that week. So that’s why molting means the end of the breeding season: feeding chicks and molting just takes too much energy for a bird to handle at the same time. Sometimes, when birds are really pressed for time, they’ve been known to molt while still feeding fledglings, but that is rare. YAIY molting his entire tail, with just one ratty, broken feather left. Usually it’s advisable to retain the old feathers until the new ones have started coming in, YAIY! 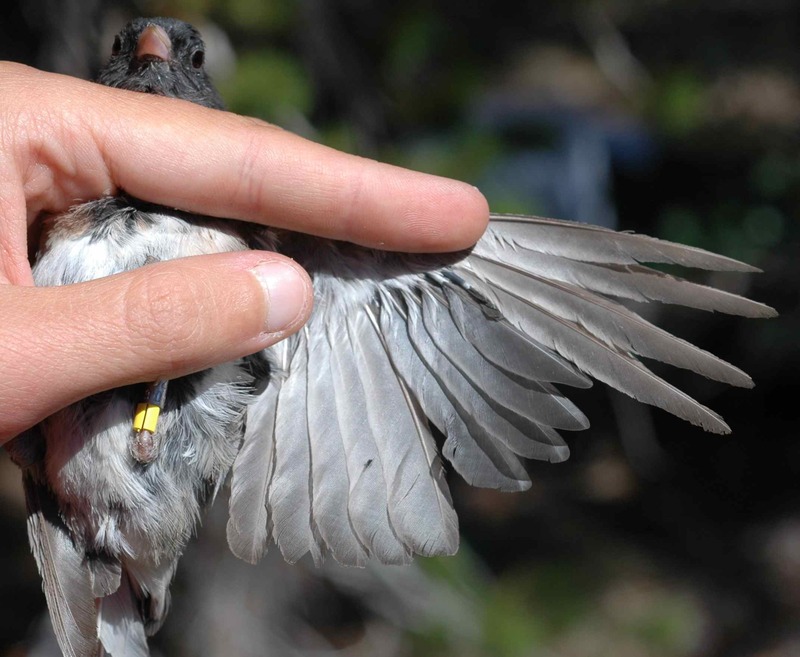 This entry was posted in DEJU, field work, notable juncos and tagged ALGE, birds, Dark-eyed Junco, feathers, molt, NLOA, science, YAIY by toughlittlebirds. Bookmark the permalink.